The Brattleboro Music Center welcomes volunteers throughout the year in many valuable roles. Getting involved with the BMC is a wonderful way to do good in the community while meeting new friends and music lovers of all ages. Whether you’re able to help out at a single Sunday afternoon concert or would like to commit to a regular schedule in the office, we want to hear from you. 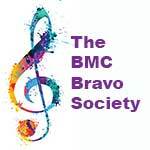 BMC volunteers automatically become members of the Bravo Society and are honored on our homepage and in our monthly e-newsletter. If you are interested in volunteering with us (and we hope you are! ), please complete the form linked below or contact Gay Foster at (802) 257-4523.